Neither of us grew up in families that celebrated St. Patrick’s Day, with the exception of the occasional bowl of dyed green mashed potatoes at Steve’s house. And no one drank Irish whiskey. We both had to come to it later in life. It was about five years ago that Paul brought home a bottle of Jameson. It sat on the shelf for a spell before he decided to mix a cocktail with it using pears as the theme. Thinking about pears mixed with whiskey made him reach for that bottle from which poured a slightly earthy but clean taste somewhat reminiscent of a smooth blended scotch, but without all the peatiness. Jameson makes for a good mixer. It really enhances the flavors of the other ingredients in a cocktail. So Paul thought about how much he liked the sweet, peaty Drambuie–Scotch blend that makes a Rusty Nail. Why not apply the same principal to a cocktail using Irish whiskey in lieu of the Scotch, and embellish the Drambuie with 2 blasts of pear: from a liqueur, and from freshly pureed Red Bartletts. 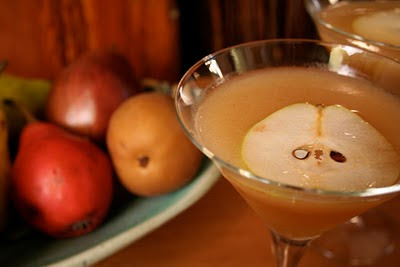 What then became the “Oh Pear” would further become the third-place winner in the USA Pears/Imbibe Magazine Pear Cocktail Contest. Shake in ice for 15 seconds. Strain into a chilled cocktail glass. Garnish with pear slice, if desired. We’re not going to lie; the Oh Pear is a strong drink, but the alcoholic strength is tempered by the sweetness of fresh pears and the incredible Bartlett richness of a good pear liqueur, such as Belle de Brillet, American Fruits, or Clear Creek. If you cannot make pear puree at home from ripe pears such as Bartlett, Comice, or Anjou, then find a pear puree that doesn’t contain added sugars and other juices, if possible. Even though we consider it a fall cocktail, there’s still enough of a chill in the air to warrant a round of Oh Pears with your friends. And if possible, you can make Cheddar Blue Fricos to pair with them. Fricos are wafer-thin lacy fried-cheese crisps you may have had using the traditional Parmesan. But we’ve embellished a bit, to go with the Oh Pear, and have blended some sharp Cheddar with a hint of blue cheese, and some herbs and spices. So you don’t want to whip out the juicer to make an Oh Pear? Okay. Here’s an easy twist on a classic Manhattan that brings a big Erin-Go-Bragh grin to our faces. Irish eyes are smiling this month with a forgotten classic, the Paddy Cocktail. What better way to celebrate St. Patrick’s Day than a cocktail named after an Irishman. When you first bring a Paddy Cocktail to your lips, you’ll smell the caramel, with hints of vanilla and cherry. The first taste will prove that you weren’t imagining the aroma, and it will bring you back to the holidays . 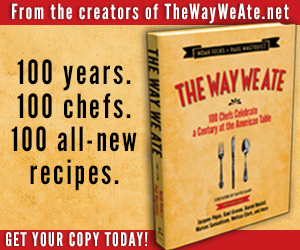 . . as if you were drinking a whiskey-soaked cake. It’s perfect before or after your meal, or both if you’re St. Patrick’s Day revels are happening at home or close to a cab (it’s a strong drink, after all). The Paddy Cocktail is now one of our favorites, and it’s a great addition to your Irish whiskey cocktail repertoire. Stir in ice for 30 seconds and strain into chilled coupe or cocktail glass. 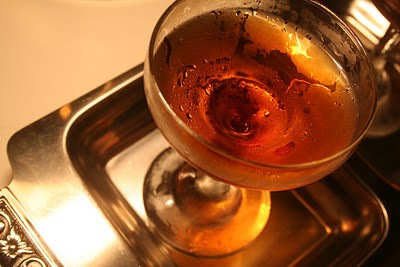 (If you cannot find Carpano Antica, just use your favorite sweet vermouth.) Bottoms up! The Srirachacha, a savory Martini with just a drop of Sriracha chili sauce and a dash of celery bitters, garnished with a pickled green tomato. One cold Sunday night this past January, we were too lazy to go out and brave the frigidaire that was Brooklyn, so we quadruple-locked the door and said to each other “Let’s make a Martini . . . but not a Martini Martini.” Something a little more exotic. So we looked in the frigidaire that was in our kitchen and Steve whipped out a jar of Rick’s Picks Pickled Green Tomatoes. Acknowledging his choice, I espied a brightly vermilion-hued squeeze bottle of Sriracha hot sauce. We know you’ve seen it. If it’s the original from Huy Fong Foods, it’s got a big outline of a rooster on the front and a neon green cap. It’s actually an American invention, by David Tran, in 1984, who wanted to make a ketchup-like condiment, but one that reminded him of the chilies back home in Vietnam. (There are other Sriracha chili sauces on the market, such as Roland, which looks similar, but has two yellow Chinese dragons on the bottle, and a mustard yellow cap.) Well, we decided that this sauce (pronounced SIR-rotch-ah) was going to some how mix with gin and dry vermouth to create a new cocktail, based on an old favorite. We had some Dolin dry vermouth in the fridge, and some sample mini bottles of Death’s Door gin that we picked up at Tales of the Cocktail last summer. If you haven’t had a drink made with Death’s Door, you must seek one out. The gin, from Wisconsin, is made with organic wheat and juniper berries found wild on Washington Island. You can taste the juniper, along with zingy fennel and bright coriander, in the gin, and it mixes extremely well with the Dolin. Old-school Martinis have a dash of orange bitters, but we decided to wait on adding bitters until we added the hot sauce. Deciding on old-school measurements, we gave the gin and vermouth a ratio of 3 to 1. Since dry vermouth loves to swish around with gin, why not send the two into quivers of sprituous delight. In thinking of the amount of Sriracha, we decided on but one drop per drink. Why overdo a good thing. After a quick shake and a taste, we were pleasantly surprised at how much we liked it. And only a hint of the Sriracha came through, just enough to elevate this drink to something more complex. However, we both knew that a little bit of bitters was needed, but not orange. Celery would be more befitting. Just a dash did the trick. And adding a nibble of pickled green tomato made the last bite a perfect end to a harmonious drink. Steve dubbed it “Srirachacha” (stress on the final syllable), and we proceeded to do some not-in-synch, pseudo-sixties parlor-hipster Cha Cha moves. It proved to be a great pre-dinner appetite stimulator (the drink, not the dancing), because as soon as Steve was making up another batch, I was sauteeing up some chicken cutlets piccata-style, with a little Singapore seasoning added to the flour, plus more as the chicken lay sizzling in the butter-drenched skillet. And to top off those golden moist cutlets: Sriracha sauce, of course, and a little candied citron, for good measure. So, when there’s still a nip of cold in the air, but the promise of spring teases us with a sunny day, heat things up with the Srirachacha. A drop of Sriracha chili sauce is all you need. 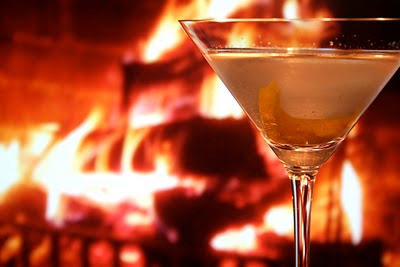 Think of it as a a crisp martini with a warm glow. And don’t forget to treat yourself to some Seared Singapore Chicken Cutlets as a little side. Bon appetit.